The Singapore Business Federation (SBF) has launched a new foundation arm that it hopes will spur greater corporate activism in the local business community. The SBF Foundation, a registered charity, has amassed $18 million since fund-raising began in July and the plan is to eventually reach a steady state of maintaining about $30 million in its coffers. Prime Minister Lee Hsien Loong launched the foundation yesterday, after which he had lunch with its board of directors and founding donors. During the event at the Pan Pacific Hotel, it was announced that Far East Organization would donate a 22,000 sq ft space at the upcoming SBF Center for the foundation's use. The 31-storey commercial development at Robinson Road will be ready by the end of 2016. SBF chairman Tony Chew, who first mooted the idea of setting up such a foundation last year, noted the growing sentiment among the business community of its role in creating a "fair, equitable and inclusive" society. "Increasingly, businesses are not just focused on doing well. Many are now looking to do well by doing good," he said. "It's no longer just the economic bottom line that companies are chasing, but the triple bottom line - economic, social and environmental." Beyond this, the foundation also wants to improve the welfare of less privileged employees and promote the education and employability of disadvantaged youths. The SBF Foundation's new chairman, Theresa Foo, said she would like to see more small and medium-sized enterprises (SMEs) come on board the corporate and social responsibility (CSR) and corporate philanthropy bandwagon. Mrs Foo, who is also chairman of The Esplanade and Gardens By The Bay, said the foundation would partner the National Volunteer and Philanthropy Centre to raise awareness of the importance of corporate giving, as well as the avenues for companies to do so. "We hope that once companies, especially the smaller SMEs, become equipped with the knowledge and skills to do so, they will be able to reach out to a larger group of non-profit organisations and their beneficiaries," she said. Mrs Foo cited education as one area where the SBF Foundation could make its mark. But beyond just funding scholarships or bursaries, the plan is to send students on internships and attachments, both locally and abroad. The Institute of Technical Education (ITE), for instance, has already made known its need for funding for its overseas industrial attachment programme, where students undertake work and training related to their course of study in a foreign country for about three to four weeks. Mrs Foo confirmed that, for a start, some 150 ITE students will be given such an opportunity to travel under this programme over the next two years using the SBF Foundation funds. Writing in a Facebook post later, Prime Minister Lee said those who have done well in Singapore should give back to society. 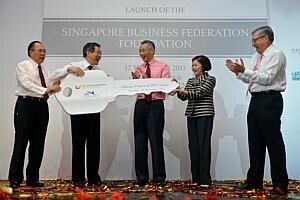 "I'm glad the Singapore Business Federation has taken this message to heart and launched the SBF Foundation," said Mr Lee as he called on the business community to continue to support the foundation in its work.